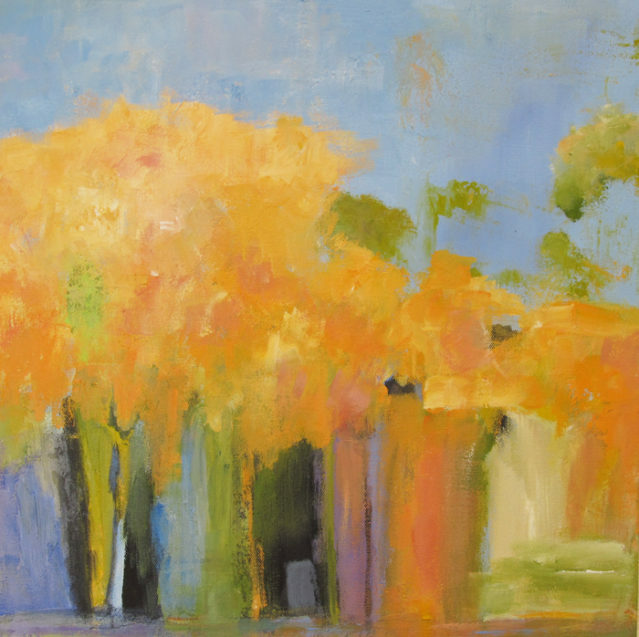 Abstract landscape paintings by Ann Hart Marquis are vibrant and imaginative. Ann is a New Mexico artist who is a nature lover. She creates vivid abstract landscape paintings. She uses acrylic, charcoal and oil on canvas. Her work creates a sense of connection, emotion and ideas about the natural world. She strives to reveal the beauty and mystery of the environment and its fragility. Ann’s work is also deeply influenced by travel. Not only is she affected by the scenery and the countryside, she is also influenced by the age of a country, the people, the food, the quiet country roads and the lovely villages where she has traveled. She is also particularly sensitive to the myths and mysteries of each place. Her abstract landscape paintings of Ireland, France,Greece, California and New Mexico include colors that particularly made an impression on her. She does not use photographs to guide her work. She paints from memories and feelings that were ignited in those locations. Ann paints abstracts without any particular idea of representing an object or scene. She layers colors, shapes and lines on top of each other with little forethought. For Ann, abstract art has the ability to sometimes express what other painting styles cannot. It can address ideas that are indefinable and imaginary, existing in mind and spirit, rather than in concrete reality. Abstract art can touch the emotions in an inventive, authentic and thought-provoking way. Photographs by Ann Hart Marquis.